Nautical Trivia, the talk of the sea. 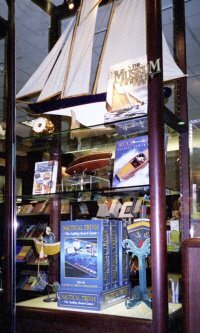 Mystic Seaport Maritime Museum Store: Nautical Trivia is excited to announce that Mystic Seaport Maritime Museum has added Nautical Trivia to their museum gift store. Mystic Seaport Museum, the country's leading maritime museum, offers you the opportunity to go back in time as you stroll through their 19th century whaling village of historic buildings and tall ships. Relive the days of our seafaring past. Afterwards, we invite you to visit their impressive maritime museum store where Nautical Trivia is now available for you the take home and test your knowledge all things maritime!